SheWhisperer Requirements are displayed in italics. 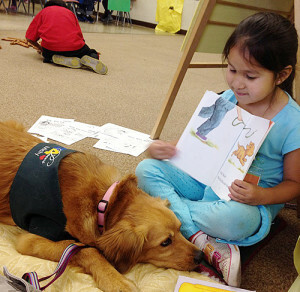 Therapy Dog training and testing in northern and southern California. This test demonstrates that the dog will allow a friendly stranger to approach it and speak to the handler in a natural, everyday situation. I will greet the handler and shake hands. The dog must show no sign of resentment or shyness, and must not break position or try to come to me. This test demonstrates that the dog will allow a friendly stranger to touch it while it is out with its handler. The dog should sit at the handler’s side as I approach and begin to pet the dog on the head and body only. The dog may stand in place to accept petting. The dog must not show shyness or resentment. This practical test demonstrates that the dog will welcome being groomed and examined and will permit a stranger, such as a veterinarian, groomer or friend, to do so. It also demonstrates the owner’s care, concern and sense of responsibility. I will inspect the dog, then comb or brush the dog, and lightly examine the ears and each foot. This test demonstrates that the handler is in control of the dog. The dog can be on either side of the handler, whichever the handler prefers. There must be a left turn, a right turn and an about turn, with at least one stop in between. The dog need not be perfectly aligned with the handler and need not sit when the handler stops. This test demonstrates that the dog can move about politely in pedestrian traffic and is under control in public places. The dog and handler walk around and pass close to several people (at least three). The dog may show some interest in the strangers, without appearing over exuberant, shy or resentful. The handler may talk to the dog and encourage or praise the dog throughout the test. The dog should not be pulling at the leash. This test demonstrates that the dog has been trained, will respond to the handler’s command to sit and down, and will remain in the place. (Sit or Down position, whichever the handler prefers). The dog must stay, while the handler walks forward the length of a 20-foot line. The dog must remain in place, but may change positions. I will provide a distraction to demonstrate the dog’s confidence and respect for the handler. This test demonstrates that the dog will come when called by the handler. The handler will walk 10 feet away from the dog, turn to face the dog, and call the dog. Again, a distraction will be provided. This test demonstrates that the dog is confident at all times when faced with common distracting situations, such as a loud noise or a jogger running in front of the dog. The dog may express a natural interest and curiosity and/or appear slightly startled, but should not panic, try to run away, show aggressiveness or bark. Leave-It: The handler with the dog on a loose leash walks past food on the ground and, upon command; the dog should ignore the food. Acclimation to Infirmities: This test demonstrates the dog’s confidence when exposed to people walking with an uneven gait, shuffling, breathing heavily, coughing, wheezing or other distractions, which may be encountered in a facility. This test demonstrates that a dog can be left with a trusted person, if necessary, and will maintain its training and good manners. The handler will go out of sight for three minutes. The dogshould remain patiently until you return, i.e., not continually bark, whine, or pace unnecessarily, or show anything stronger than mild concern. The dog must be able to work well around all types of people, including children. The dog’s behavior around children will be evaluated during testing. The dog will be observed for a reaction toward children playing, running or in general children present at the testing site. Any negative reaction by the dog will result in automatic failure. Negative reaction means a dog showing signs of aggression, or fear. Dogs must be tested on a plain buckle collar or harness. Training collars, training harnesses, halties, or any other corrective devices are not permitted during testing or visiting, as a SHEWHISPERER registered Therapy Dog.